As part of the compromises that led to the adoption of the United States Constitution in 1789, the new Federal government agreed to assume the Revolutionary War debts of the 13 States. In early 1791, to help pay off the resulting national debt, Congress used its new constitutional authority to "lay and collect Taxes, Duties, Imposts and Excises" and passed the first nationwide internal revenue tax—an excise tax on distilled spirits. Congress took this action at the urging of the first Secretary of the Treasury, Alexander Hamilton. Alexander Hamilton, first Secretary of the Treasury (1789-1795). Unlike tariffs paid on goods imported into the United States, the excise tax on distilled spirits was a direct tax on Americans who produced whiskey and other alcohol spirits. The 1791 excise law set a varying six to 18-cent per gallon tax rate, with smaller distillers often paying more than twice per gallon what larger producers paid. All payments had to be made in cash to the Federal revenue officer appointed for the distiller's county. Large, commercial distillers in the eastern United States generally accepted the new excise tax since they could pass its cost onto their cash-paying customers. However, most smaller producers west of the Appalachian and Allegheny Mountains, then the Nation's frontier, opposed the "whiskey tax." While eastern farmers could readily transport their grain to market, westerners faced the hard task of moving their crops great distances to the east over the mountains along poor dirt roads. Given this difficulty, many frontier farmers distilled their surplus grain into more easily transportable whiskey. In doing so, their grain became taxable distilled spirits under the 1791 excise law, and western farmers opposed what was, in effect, a tax on their main crop. Usually cash-poor, frontier residents also used whiskey to pay for the goods and services they needed. Naturally, many westerners quickly came to resent the new excise tax on their "currency." Other aspects of the excise law also caused concern. The law required all stills to be registered, and those cited for failure to pay the tax had to appear in distant Federal, rather than local, courts. In Pennsylvania, for example, the only Federal courthouse was in Philadelphia, some 300 miles away from the small frontier settlement of Pittsburgh. In addition, many were upset by what they saw as the National government's inattention to continuing Indian attacks along the frontier and, with Spain's control of New Orleans, westerners were frustrated with the failure of the Government to open the Mississippi River to free American trade. A receipt for the whiskey tax, 1798. From the beginning, the Federal government had little success in collecting the whiskey tax along the frontier. While many small western distillers simply refused to pay the tax, others took a more violent stand against it. Federal revenue officers and local residents who assisted them bore the brunt of the protester's ire. Tax rebels tarred and feathered several whiskey tax collectors and threatened or beat many who offered them office space or housing. As a result, many western counties never had a resident Federal tax official. Despite the President's plea and Congressional modification of the excise law,  violent opposition to the whiskey tax continued to grow over the next two years. This was especially true in the four counties of southwestern Pennsylvania —Allegheny, Fayette, Washington, and Westmoreland—the location of up to one-fourth of the Nation's stills. In the summer of 1794, U.S. Marshal David Lennon arrived in the area to serve writs ordering those who had refused to pay the whiskey tax to appear in Federal court in Philadelphia. In Washington County, Federal revenue officer John Neville acted as Lennox 's guide. On July 15th, the two men served a writ on William Miller, but, after leaving the paper with the angry frontiersman, they were met by an armed group of his neighbors. A shot was heard as Lennox and Neville rode off, but neither man was injured. Matters came to a head on July 16th when a group of angry farmers, including members of the extended Miller family, marched on Neville's house in the belief that Marshal Lennox was there. Confronted by these armed men, Neville shot and killed Oliver Miller. 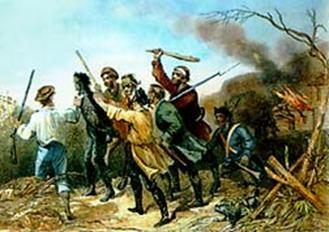 A shootout ensued, and Neville's slaves joined the fight by firing on the mob from their quarters. The protesters fled, but returned to Neville's house on July 17th with a force of 500 local militiamen. The tax collector, however, had slipped away earlier with the aid of a small squad of Federal soldiers from Fort Pitt who had come to guard his property. A shootout with the soldiers left rebel leader James McFarlane dead, but the greatly outnumbered Federals later surrendered. The rebels then burnt the Neville's house and barn to the ground. Several days later, David Bradford, deputy county attorney for Washington County, took command of the rebels in the county. A tax collector is tarred and feathered by anti-tax frontiersmen during the Whiskey Rebellion. Anti-whiskey tax violence quickly spread to other counties along the frontier. Rebels burnt the home of Benjamin Wells, the Federal collector for Fayette County, and armed men stole the mail from a post rider leaving Pittsburgh.After finding letters from their opponents, the rebels returned to the town and beat the letter's authors. Anti-tax meetings were held throughout the region in late July. Despite appeals from anti-tax leaders such as newspaper publisher Hugh Henry Brackenridge and businessman and State legislator Albert Gallatin for a peaceful resolution of the crisis, calls went out for the local militia to gather at Braddock's Field near Pittsburgh. After several thousand armed rebels gathered at Braddock's Field during the last week in July 1794, President Washington met on August 2nd with his Cabinet and the governor of Pennsylvania, Thomas Mifflin, to consider the situation. The President issued a proclamation on August 7th calling on the rebels" to disperse and retire peaceably to their respective abodes." The proclamation also invoked the Militia Act of 1792, which, after Federal court approval, allowed the President to use State militiamen to put down internal rebellions and "cause the laws to be duly executed." The same day, Secretary of War Henry Knox sent a letter to the governors of Maryland, New Jersey, Pennsylvania, and Virginia requesting a total of 12,950 militiamen to put down the rebellion. In a last bid to avoid a confrontation, President Washington sent Attorney General William Bradford, Senator James Ross of Pennsylvania, and Pennsylvania Supreme Court justice Jasper Yeates to meet with rebel leaders. In late August and early September, the three Federal commissioners held talks with a 15-member committee appointed by a rebel assembly representing the four frontier counties of Pennsylvania and Ohio County in Virginia.The rebel committee included Hugh Henry Brackenridge, David Bradford, Albert Gallatin, and other prominent community leaders. Unable to find a peaceful solution to the spreading rebellion, the Federal commissioners returned to Philadelphia on September 24, 1794, where they reported that it was "absolutely necessary that the civil authority should be aided by a military force in order to secure a due execution of the laws." 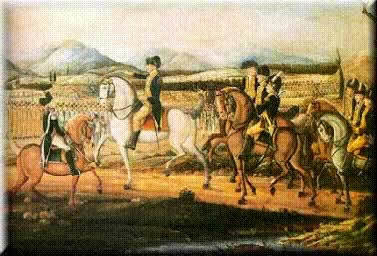 President Washington, astride a white horse, reviews his troops at Carlisle, Pennsylvania in September 1794. In the mean time, almost 13,000 militiamen had gathered at Carlisle, Penn-sylvania, and prepared to march west to end the rebellion. On September 19, 1794, George Washington became the only sitting U.S. President to personally lead troops in the field when he led the militia on a nearly month-long march west over the Allegheny Mountains to the town of Bedford. On September 25th, the President issued a proclamation declaring that he would not allow "a small portion of the United States [to] dictate to the whole union," and called on all persons "not to abet, aid, or comfort the Insurgents." After leading the troops to Bedford, Washington returned to Philadelphia in late October and placed General Henry "Lighthorse" Lee, a Revolutionary War hero and governor of Virginia, in command. Washington left a letter with Lee with instructions to combat those "who may be found in arms in opposition to the National will and authority" and "to aid and support the civil Magistrate in bringing offenders to justice." Secretary of the Treasury Alexander Hamilton also remained with General Lee and the troops. In late October 1794, the Federalized militia entered the western counties of Pennsylvania and sought out the whiskey rebels. By mid-November, the militia had arrested 150 rebels, including 20 prominent leaders of the insurrection. Under the President's authority, General Lee issued a general pardon on November 29th for all those who taken part "in the wicked and unhappy tumults and disturbances lately existing" with the exception of 33 men named in the document. While most of the militia returned home, a regiment occupied the area until the following spring, and organized opposition to the tax evaporated. Of the whiskey rebels who were arrested, many were released due to a lack of evidence. Only a few men were tried and just two were convicted of treason. In July 1795, President Washington pardoned the two convicted men and those still in custody or under indictment. Several rebels sought for arrest fled the area, but most were later pardoned as well. President John Adams pardoned David Bradford, who escaped to Spanish-controlled New Orleans, in March 1799. While violent opposition to the whiskey tax ended, political opposition to the tax continued. Opponents of internal taxes rallied around the candidacy of Thomas Jefferson and helped him defeat President John Adams in the election of 1800. By 1802, Congress repealed the distilled spirits excise tax and all other internal Federal taxes. Until the War of 1812, the Federal government would rely solely on import tariffs for revenue, which quickly grew with the Nation's expanding foreign trade. Most whiskey rebels returned to their previous lives and occupations, and some rose to prominence in their communities and the Nation. Hugh Henry Brackenridge, already a leading author and founder of the Pittsburgh Gazette, wrote a book on the uprising and would become a Pennsylvania Supreme Court justice. William Findley, who urged peaceful protest of the whiskey tax, also wrote a book on the rebellion, and was elected repeatedly to Congress. Albert Gallatin, Secretary of the Treasury (1801-1814). 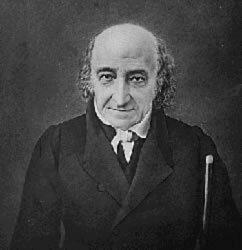 Albert Gallatin, a leading Pennsylvania businessman, land developer, and State legislator long opposed internal Federal taxes. Given the opposition, his Fayette county neighbors elected him to the rebel assembly during the Whiskey Rebellion. While in the assembly, however, Gallatin spoke out against an open, violent break with the National government, and he also served on the 15-member committee that met with President Washington's three commissioners in an attempt to end to the crisis peacefully. Gallatin 's name appeared on a list of rebel leaders, but he was never arrested for his role in the Whiskey Rebellion. Elected to Congress after the rebellion, Gallatin worked for a more exact accounting of the Federal government's finances, leading President Thomas Jefferson to appoint him Secretary of the Treasury, a post he also held under President James Madison. In 1802, Gallatin oversaw the ending of all direct, internal Federal taxes, including the distilled spirits tax. During the War of 1812, however, the rising costs of fighting Great Britain forced Gallatin to seek and win Congressional approval of new Federal excise taxes on carriages, sugar refining, and distilled spirits in 1813. In 1814, Gallatin left the Department of the Treasury and helped negotiate the Treaty of Ghent, which ended the War of 1812. He later served as ambassador to France and to Great Britain.After retiring from Government service, he was president of the National City Bank of New York, and he helped found New York University.Gallatin later wrote that his participation in the Whiskey Rebellion was his "only political sin." In the end, the Whiskey Rebellion served as one of the first tests of the new Constitution and the Federal government's authority. It was also the greatest domestic crisis of President Washington's administration. The successful suppression of the Whiskey Rebellion helped to confirm the supremacy of Federal law in the early United States and the right of Congress to levy and collect taxes on a nation-wide basis. Historical markers throughout southwestern Pennsylvania identify sites, homes and other buildings associated with the Whiskey Rebellion. A searchable list of historical markers can be found on the Pennsylvania Historical and Museum Commission Web site at http://www.phmc.state.pa.us/. For example, historical markers note important meeting sites of whiskey rebels at Braddock's Field, as well as Bonnet Tavern and Mingo Creek Church, both of which still stand today. Markers also note the location of a Miller family farmstead and the home of rebel leader David Bradford, both of which are now museums and open to the public. In addition, plaques mark the location of the homes of whiskey tax collectors John Neville in Allegheny County and Benjamin Wells in Fayette County.Rebels burned both houses in 1794. In addition, several sites associated with President George Washington's march west from Carlisle are marked as well, including the still-standing Espy House, his headquarters in Bedford, Pennsylvania. Alexander Hamilton's house in New York City is now the Hamilton Grange National Memorial, a unit of the National Park Service. For information on visiting the house, see the Memorial's Web site at https://www.nps.gov/hagr/index.htm for details. Albert Gallatin's house, "Friendship Hill," near Point Marion, Pennsylvania, is also a National Park Service site, and the house and grounds are open to visitors. For details, including information on Gallatin 's role in the Whiskey Rebellion, see the Friendship Hill National Historic Site Web site at https://www.nps.gov/frhi/index.htm. Short biographies of Secretaries of the Treasury Alexander Hamilton and Albert Gallatin are posted on the Department of the Treasury's Web site at https://www.treasury.gov/about/history/Pages/edu_history_secretary_index.aspx. Visit the University of Virginia's George Washington Papers Project Web site for information about viewing President Washington's diary entries for September and October 1794. Henry Adams, The Life of Albert Gallatin (Philadelphia: J.B. Lippincott & Co., 1879); reprinted as The Life of Albert Gallatin, Selections, intro. by Raymond Walters, Jr., (New York: Chelsea House, 1983). Leland D. Baldwin, Whiskey Rebels: The Story of a Frontier Uprising (Pittsburgh: University of Pittsburgh, 1939). H.H. Brackenridge, Incidents of the Insurrection in the Western Parts of Pennsylvania in the Year 1794 ( Philadelphia : John M'Culloch, 1795); reprint, Daniel Marder, Incidents of the Insurrection, Edited for the Modern Reader (New Haven, Conn.: College & University Press, 1972). Richard Brookhiser, Alexander Hamilton, American (New York: Free Press, 1999). Jerry A. Clouse, The Whiskey Rebellion: Southwestern Pennsylvania 's Frontier People Test the American Constitution (Harrisburg, Penn. : Pennsylvania Historical and Museum Commission, 1994). William Findley, History of the Insurrection in the Four Western Counties of Pennsylvania in the Year 1794 ( Philadelphia : Samuel Harrison Smith, 1796); reprint, Reprint Co., Spartanburg, S.C., 1984. Marie B. Hecht, Odd Destiny, the Life of Alexander Hamilton (New York: Macmillan, 1982). Thomas P. Slaughter, Whiskey Rebellion: Frontier Epilogue to the American Revolution (New York: Oxford University Press, 1986). Raymond Walter, Jr., Albert Gallatin, Jeffersonian Financier and Diplomat (New York: Macmillan, 1957). See U.S. Constitution, article I, section 8; and the Excise Act of March 3, 1791, in Richard Peters, ed., The Public Statutes at Large of the United States of America (Boston, 1845-46, 8 vols. ), vol. 1, pgs. 199-214. The act is officially titled "An Act repealing, after the last day of June next, the duties heretofore laid upon Distilled Spirits imported from abroad, and laying others in their stead; and also upon Spirits distilled within the United States, and for appropriating the same." The proclamation appeared in the National Gazette on September 29, 1792. To address some of the westerners' concerns, Congress modified the excise act in May 1792 and again in June 1794. See "An Act concerning the Duties on Spirits distilled within the United States," passed May 8, 1792, in Peters, The Public Statutes at Large, vol. 1, pgs. 267-271; and "An Act making further provision for securing and collecting the Duties on foreign and domestic distilled Spirits, Stills, Wines and Teas" passed June 5, 1794, in ibid, pgs. 378-381. Proclamation by the President, August 7, 1794, Pennsylvania Archives, 2nd series, vol. 4, pgs.105-08. The proclamation was published in Claypoole's Daily Advertiser on August 11, 1794. Under the Militia Act of 1792, before the President could use State militia to repress an internal rebellion, a Federal judge had to rule that the laws of the United States were "opposed, or the execution thereof obstructed, in any state, by combinations too powerful to be suppressed by the ordinary course of judicial proceedings, or by the powers vested in the marshals by this act." See "An Act to provide for calling forth the Militia to execute the laws of the Union, suppress insurrections, and repel invasions," passed May 2, 1792, in Peters, The Public Statutes at Large, vol. 1, pgs. 264-266. Associate Supreme Court Justice James Wilson authorized the use of the militia when he ruled on August 4, 1794, that the evidence presented to him showed a rebellion was underway in western Pennsylvania that could not be suppressed by normal judicial proceedings or by the area's U.S. Marshal. See the letter, Wilson to Washington, National Archives, Record Group 46, President's Messages. See the Commissioner's report, in the Pennsylvania Archives, 2nd series, vol. 4, pgs. 293-302. President Washington's proclamation was published in the Gazette of the United States ( Philadelphia ), September 25, 1794. George Washington to Henry Lee, October 20, 1794, George Washington Papers at the Library of Congress, 1741-1799, Series 2 Letterbooks, Letterbook 40. General Lee also published the letter in his orders of October 21, 1794. Proclamation by Henry Lee, November 29, 1794, New Jersey Historical Society Archives, Manuscript Group 938, Henry Lee (1758-1818), Major General, General Orders, 1794, Call Number: MG 938. See H.H. Brackenridge, Incidents of the Insurrection in the Western Parts of Pennsylvania in the Year 1794 ( Philadelphia : John M'Culloch, 1795); reprint, Daniel Marder, Incidents of the Insurrection, Edited for the Modern Reader (New Haven, Conn.: College & University Press, 1972). See William Findley, History of the Insurrection in the Four Western Counties of Pennsylvania in the Year 1794 ( Philadelphia, Samuel Harrison Smith, 1796). See Henry Adams, The Life of Albert Gallatin, (Philadelphia, J.B. Lippincott & Co., 1879), vol. 3, pgs. 6-7; reprinted Life of Albert Gallatin, Selections, with and introduction by Raymond Walters, Jr. (New York: Chelsea House, 1983).